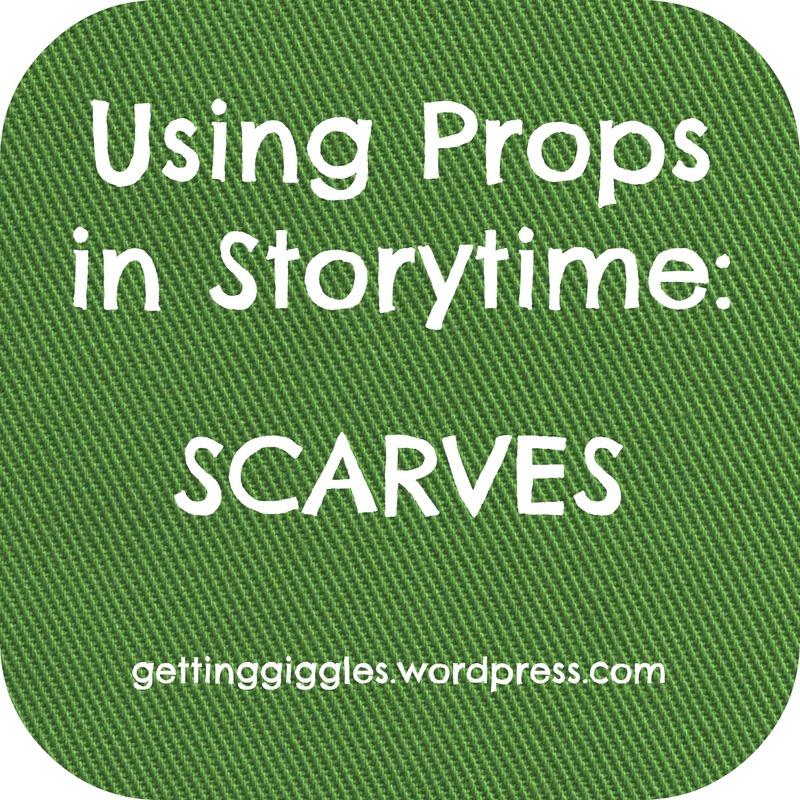 This is my second post on using props in storytime. My first post was on shakers. Scarves are tied with shakers as my favorite prop and I use them a lot. They’re really versatile and once you start using them, you’ll start seeing more opportunities to incorporate them into your programs. I have the Lakeshore Learning scarves, which are high-quality (they’re still in great shape after having been through a lot of manhandling, nibbling, spit-up incidents, etc., and they come out of the washing machine looking new). I’ve noted below which activities work particularly well with babies and toddlers; everything else is good for older toddlers and preschoolers. Color identification. Hand the scarves out and then have the kids wave their scarf when you call out the color they have. (See how Abby the Librarian jazzes this concept up a bit here.) You can also modify the song “If You’re Wearing Red Today” to “If You Have a Red Scarf” and have the kids do different motions depending on the color of their scarf. (See Abby’s post, above, if you don’t know the song). Use them to pretend. Show the kids a few things you could pretend your scarves are: oars! leaves falling from the sky! a parachute! butterfly wings! Then ask them for more ideas. This works best with older preschoolers. Use them with books. Thrive After Three has a great post on how to incorporate scarves into your readings of books like Freight Train, Dog’s Colorful Day and Tip, Tip, Dig, Dig. Play peek-a-boo with babies and toddlers! There are cute peek-a-boo songs, but I usually just have everyone count to three and… peek-a-boo! Count to three and throw your scarves in the air! Repeat again and again. This is a good activity to close with and is good for all ages (baby to preschooler). If I have extra scarves, I’ll scoop all of them up and throw them in the air in one big heap. And below are some of my favorite songs to use with scarves. Of course, you can use scarves with just about any music (like “Let’s Go Fly a Kite” or music from the Nutcracker–just dance to the music with the scarves! ), but I personally have more success with structured songs that give you specific actions, which is what the ones below are. Popcorn Kernels – from the Future Librarian Superhero blog; this is a genius song and the kids love. it. This fall I was looking to freshen up my scarf routine, so I found a few new rhymes from–where else–Jbrary! Some new favorites are Jack in the Box and Little Bo Peep. And for even more scarf activities, here’s an awesome post from Jbrary with their favorite scarf songs; at the bottom of that post is a list of even more blog posts about using scarves. Last, but not least, I am dying to try out Brooke from Reading With Red’s tissue boxes full of scarves activity. This is one of those activities that is so simple and yet so genius. I just need to round up some tissue boxes and then I plan to do this as part of my post-baby and -toddler storytime play time!